This recipe is perfect for a light meal. Remember, sweet potatoes need a little cooking to soften them before they can be griddled. Cook the whole sweet potatoes in boiling water for 10 minutes or until almost tender. Test with the point of a sharp knife to see if they are cooked. Drain and slice into 1cm pieces. Toss in the olive oil and season. Heat a griddle pan and griddle the potato slices in batches for 2-3 minutes each side, until charred and tender. 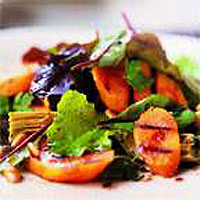 Toss the warm sweet potato with the sliced artichoke hearts, pine nuts and salad leaves. To make the dressing, spoon 3 tbsp artichoke oil out of the tub into a small bowl. Whisk with the balsamic vinegar and seasoning. Arrange the salad on serving plates and drizzle with the dressing. Serve immediately with crusty rolls. If you don't want to use sweet potatoes, parsnips or swede will also work well. This recipe was first published in September 2000.